Australia day is just around the corner and we are getting into the Australian spirit by celebrating our favourite Australian dogs. There are many things to love about these animals we’ve come to call our own, from the small and friendly nature of the Australian Silky Terrier, to the hard-working attitude of the Australian Kelpie. Read on below for our 5 favourite Australian dogs. This small and friendly dog has been around since the nineteenth century, and is known for having a silky coat and playful personality. Its fun loving nature makes this dog breed a great addition to families as they are easy-going and moderately active. You can recognise this breed by its small stature, pointy ears, long hair and alert appearance. They typically have silver and tan or black and tan coloured coats that usually requires regular washing and grooming. These cheeky dogs love to take on larger dogs and aren’t scared very easily so obedience classes are recommended. Developed for herding cattle and sheep, the Australian Kelpie is a hard-working dog with a very active nature, so they need to be put to work or walked regularly. This highly intelligent dog breed is tough and independent and is typically recognised by their long body, narrow head and small feet, usually with coats that are black, chocolate or smoky blue. The Australian Kelpie is Australia’s most popular working dog and is an ideal addition to any farm family as it loves to take orders and run around! This dog breed is instantly recognisable by its friendly and wide-eyed appearance and is a cross between a Labrador Retriever and a Poodle. The dog breed also comes from a number of other parent breeds, including the Irish Water Spaniel, Curly Coated Retriever, American Cocker Spaniel and English Cocker Spaniel, which give them a unique personality, appearance and skills. The Labradoodle is a shaggy looking dog and usually has a coat in colours of gold, black, cream and brown. They love to be around people and radiate energy wherever they go. The Australian Cattle dog is not dissimilar to the Kelpie, as it was developed in the 1800’s to work on the Australian farms. This type of dog has a loyal, hard-working nature with a particular natural aptitude for herding cattle and sheep over long distances. 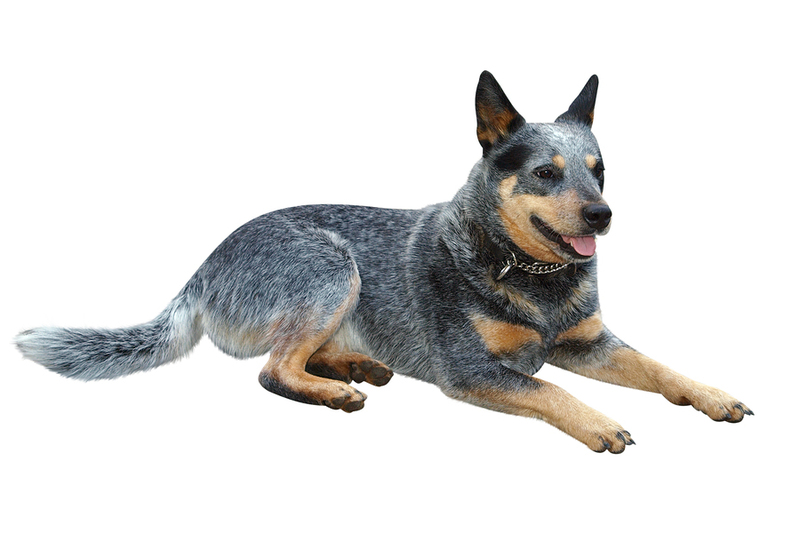 The Australian Cattle dog is recognisable by its black or brown coat that is typically mixed with a white coat, creating a blue or reddish appearance. It is highly intelligent with a strong sense of independence and responds well to daily exercise and challenging tasks or training. The Australian Bulldog is a medium-sized dog with a friendly and easy-going personality and makes a great addition to any family. This breed of dogs is highly active and many love to play fetch, go for a swim or a run with their owners around the park. They are loyal and intelligent, making them a great watchdog for families. Which Australian dog breed is your favourite? Comment and share with us on Facebook.